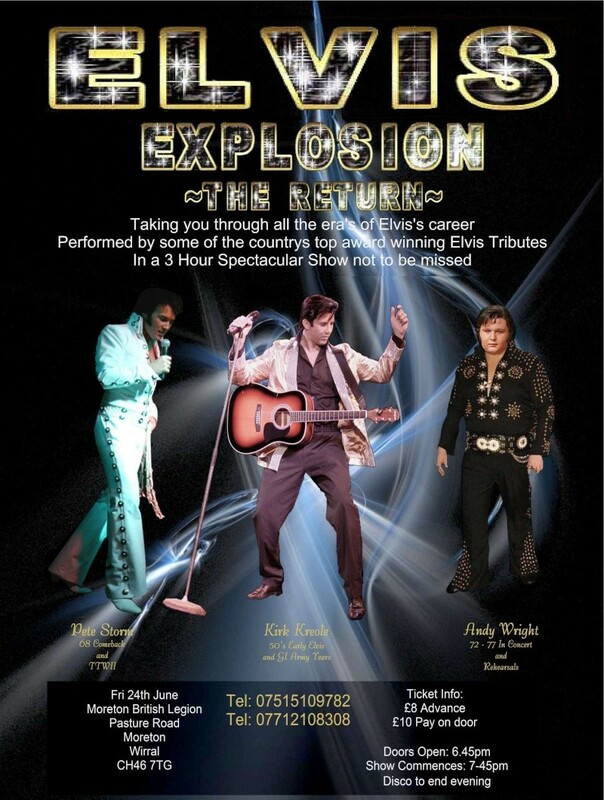 Performed by some of the countrys top award winning Elvis tributes in a 3 Man spectacular show NOT TO BE MISSED.The Show will be spanning the life of Elvis’s Career covering all the era’s , from Elvis’s early 50’s Hip Swiveling Rock ”N” Roll Years, G.I Army years, Movie/Film Years, 1968 Comeback Special to the Glitz and Glam era of the 70’s Vegas years. late bar and disco to finish evening. nice one Andy good luck with it - it will be greattttt!!! good luck, I know it will be great. thank you for your comments Michelle, Ross, Lisa and Lance, will be a great night your support is much appricated. Tickets now on sale for this amazing show and selling well so book your tickets today to avoid dissapointment, surely a show not to be missed and a rare chance to see the sensational pete storm up north as he is london based, Bargain ticket price of £8 for quick sale CAN YOU AFFORD TO MISS THIS?? 3 elvis tributes in a 3 hour show and disco/aftershow party to finish the evening with late bar. Looks like a great show Andy. thanks val are you coming? last 2 days to reserve tickets guys at the special advance price of £8 and to guarentee entry. only a handful left. i will leave them on the door on the night at the advance ticket price, anyone who does not reserve them and turns up on the night will have to pay £10. I wish I could but am planning to have a quiet weekend, cant remember the last time I had a weekend in. But I have a funny feeling I wont :-(. Just wanna say a big THANK YOU to Andy for an amazin nite! When we arrived the place was packed! Kirk was in full swing doin his GI spot and the crowd were sooo up for it! He did a great energetic set, then we had Andy in a lovely 2 piece Elvisy suit singing some songs I haven't heard for ages. Andy was on top form. Was the best Ive seen him so far. Then came out Pete Storm in his leathers, he again did a fantastic set. Was very impressed with his walk on music and sang songs from the Come Back Special you don't normally hear. Loved Big Boss Man! Just a quick change then Andy was back again in a lovely black jumpsuit and soon got the crowd all up dancing. Then Pete Storm on again in a white TTWII jumpsuit and the crowd stayed up and I don't think they sat back down again. Then for a refreshing change Kirk came on in his Gold Lame with another energetic set, belting out all the 50's tunes we know so well. Really clever I thought. Really nice end to the night.